You must see this 4 bedroom 2.5 bath well cared for home that features a master bedroom on the main level in the 29681 zip code! This home sits on a large flat corner lot in a small community with a wooded view from the back patio. 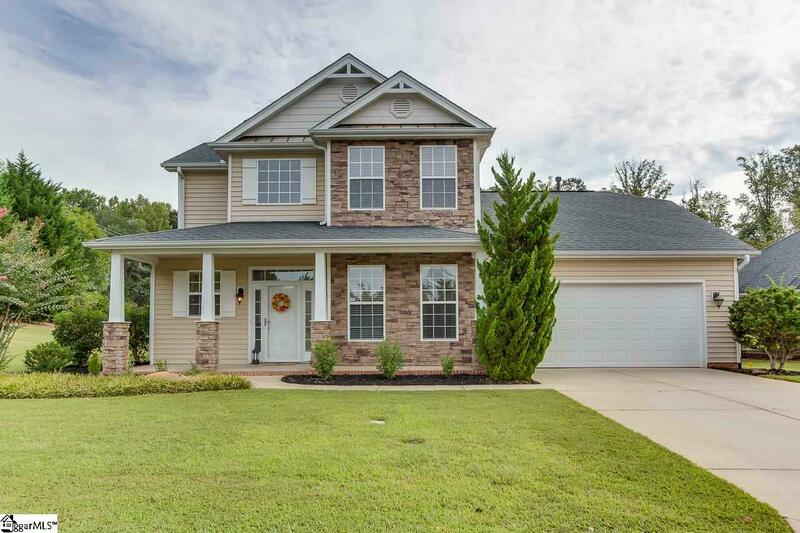 The large front porch allows for plenty of seating and leads directly into the 2 story foyer. The open floor plan allows for easy entertaining between the kitchen, living room and dining/breakfast area. An additional room on the first floor could be used as a formal living room, office, or formal dining room. The kitchen boasts ceramic tiled flooring, ample cabinet space, granite rounded edge counter tops, stainless steel appliances to include stove, refrigerator, built-in microwave, dishwasher, and garbage disposal. The Master bedroom is on the first floor and features a tray ceiling, walk in closet and a master bath with double sinks, water closet, jetted tub and separate shower. Upstairs are three additional bedrooms and a full bath. One of the additional bedrooms has a walk-in closet and one has double closets. The home also has new carpet and paint, a security system, built in speaker system, arched doorways, full yard sprinkler system, and dual air-conditioning units. Listing provided courtesy of Tammy Hooper of Only Way Realty Greenville.